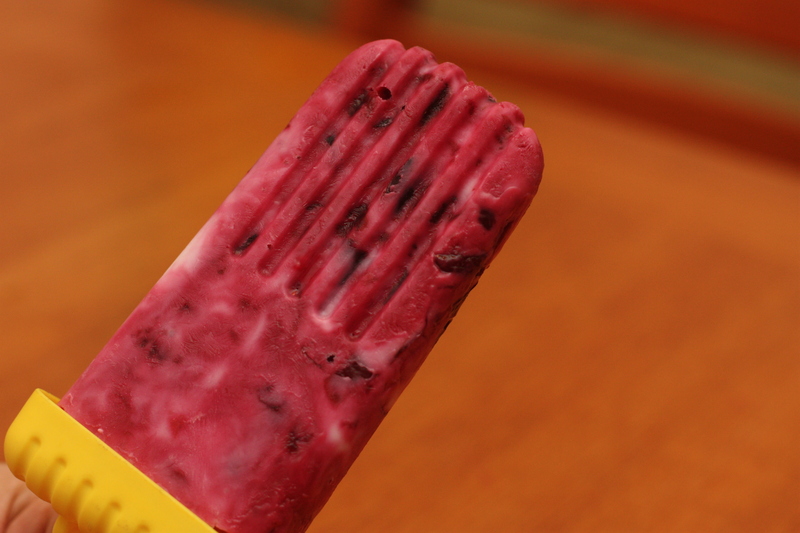 And blackberry jam would be just the thing in these popsicles. Frozen Yogurt Jam Pops (adapted from Whole Living, at Janet’s suggestion; these quantities made four big popsicles): Gently fold 3/4 c. jam (I used that easy homemade cherry jam) into 1 c. lowfat* Greek yogurt, leaving a few ribbons each of yogurt and jam. Spoon into popsicle molds and freeze at least 6 hours. *I imagine that a full-fat yogurt wouldn’t freeze as well, but I haven’t tested that theory. I love homemade frozen yogurt. I think maybe full-fat yogurt is better for frozen yogurt, though, because you want it softer and creamier. And for the popsicles you want them to freeze hard, which the low-fat yogurt does–so maybe that would make the frozen yogurt icy? Let me know if you experiment! :-) In total agreement–this is an equal jam employment opportunity. Is there a kind that would not be delish? And gorgeous photo–I am coming right over! Please do–and can you bring the Popsicle weather? We ate these inside wearing fleece. I am enjoying many frozen treats right now in this August heat. This looks like it will be perfect! So easy and such fun! Beautiful to look at too, not that they’ll last long! So true. We make popsicles almost every day to keep up with the demand! Hi! I just wanted to let you know that I nominated your blog for a Food Stories Award (http://foodstoriesblog.com/food-stories-award/). I was nominated myself – the deal is that all nominees have to present 5 blogs that they like, and I chose yours (you can see my post here – I hope you like it: http://onelilvegan.wordpress.com/2012/07/28/who-me/). These popsicles sounds A-M-A-Z-I-N-G, thanks! I’m going to try them with coconut milk yogurt. That’s so nice of you, thank you so much for the compliment! And congratulations to YOU on the award! I would love to hear how these turn out with coconut yogurt; I’ve never tried it. YUM! Jam + yogurt must make for one tasty popsicle. All four of my popsicle mold sets are full of different types of fruit or fruit juices right now, but the next one that empties out, I will have to try this! I would lose that competition! (I often need a bowl just to eat a regular popsicle.) So I guess I also wouldn’t mind having to flip them into a glass.